Rehabilitation of Bonnie Doon Leisure Centre is underway to replace and update the aging building, pool, mechanical and electrical systems. The project timeline for rehabilitation of the Bonnie Doon facility was extended due to major changes to the amount of work and project budget. Often times with older buildings, the full extent of work is not uncovered until there is an investigation deep into the building structure. This work cannot occur while the building is occupied and in full operation. We thank members and visitors to Bonnie Doon Leisure Centre for their ongoing patience. We know a longer shutdown than expected is inconvenient and we are working diligently to complete this rehabilitation project as quickly and safely as possible. The Bonnie Doon Leisure Centre closed its doors in September 2016 for rehabilitation. Once the facility was closed to the public, further inspection into the state of the building identified more opportunities for improvement which required additional design work. Adding unplanned work, as well as adjustments to the existing scope for this rehabilitation project, required an updated budget with approval from City Council. An adjusted scope, budget and schedule for this project was approved in the May, 2017 Supplemental Capital Budget Adjustment (SCBA). The Alberta Health Pool Standards were revised in 2014 and now mandate the installation of anti-entrapment devices in all pool basins according to the Public Health Act. The existing main drains will be enlarged in both the hot tub and the pool as well as new drains added to reduce pressure at the bottom of the pool to help mitigate the risk of entrapment from suction. These measures are in place to improve swimming safety. The Bonnie Doon Leisure Centre Assessment, completed in 2016, provided a review of the chemical treatment options. This information guided the City’s decision to move to a saline chlorination system (from a gas chlorination system) to meet the community’s wishes for a saltwater pool. Conversion to a salt water treatment system involves structural modifications, corrosion resistance upgrades for all filtration systems and replacement of the hot tub and pool basin lining and deck tiles. Additional design plans for this rehabilitation project included an energy audit report which identified opportunities to improve energy efficiency of the building. Recommendations in the report included replacement of the air handling and hot water systems to reduce energy costs. Rehabilitation work at the facility will improve water quality, safety measures and the overall customer experience at this facility. The facility will be refreshed, making it more welcoming for all, however most of the work will be “back of house”. What is happening at Bonnie Doon Leisure Centre? Bonnie Doon Leisure Centre is an aging facility and was identified for rehabilitation, which indicates the intent to fix, repair and/or upgrade existing infrastructure and services. Rehabilitation of mature, aging facilities such as Bonnie Doon Leisure Centre ensures a continuous commitment to sustainable community programs and services, contributing to a better quality of life for current and future generations. When will the facility reopen to the public? Bonnie Doon Leisure Centre is anticipated to reopen in Spring 2019, following completion of the rehabilitation work and preparation for welcoming public back to the facility. What happened/Why were the timelines extended? Once the facility was fully closed to staff and the public, further inspection into the building conditions identified more opportunities for improvement which required additional design work and an increased budget. An adjusted project scope, budget and schedule for this project was approved in the May, 2017 Supplemental Capital Budget Adjustment (SCBA). Adding unplanned work, as well as adjustments to the existing list of work for this rehabilitation project has extended the project timelines. Is the building being demolished? In addition to regular facility maintenance work, rehabilitation of aging facilities involves repairing and/or upgrading existing infrastructure and services. The exterior siding of the building (outdoors) will be replaced, however the building layout and size will remain the same. 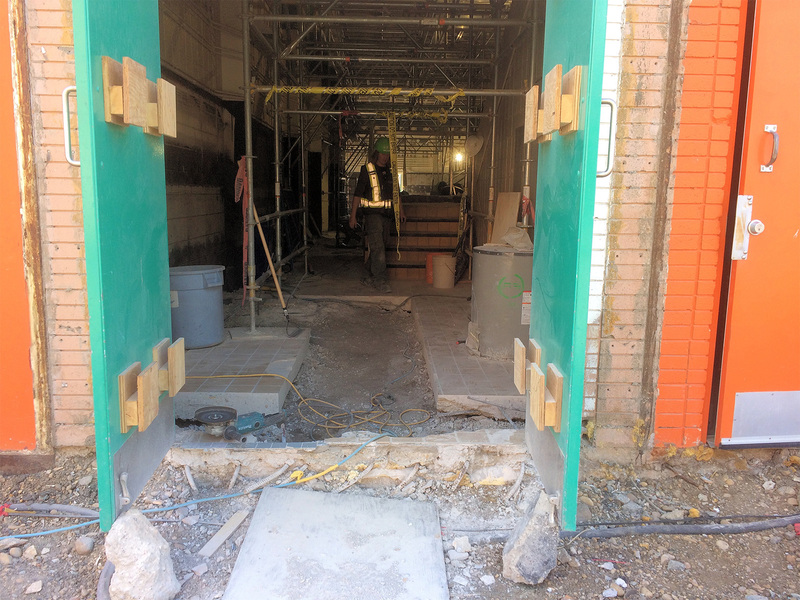 Inside the building, most work will be “back of house” repairing and upgrading mechanical and electrical systems. The amenities and services will remain the same. Is the Bonnie Doon pool project waiting for completion of the LRT? The Bonnie Doon pool rehabilitation project is independent of the LRT project. When completed, the Valley Line LRT will provide public transportation to the facility creating connections to other parts of the city. What will be noticeable once the facility reopens? Improved water quality in the pool. Improved air and light quality. Improved accessibility and flow in the front counter area. Fresh paint in the changerooms. Construction of parking and drop off area located on west side of the facility. Construction of future access off of 83 Street up to the property line. Completion of this access location will be part of LRT construction. Will there be a saltwater pool when it reopens? The pool system will be replaced with a saltwater chlorination system. The entire pool basin and filtration system will be replaced to allow for the saltwater. New pool deck and wall tiles will also be installed to accommodate the saltwater system. Will there be more parking available? The number of parking stalls available will remain the same. No additional parking. Will parking change to other side of the facility? The new parking configuration will have added parking on the west side of the facility. A new access lane will be added between the Vimy Ridge Academy and the existing parking lot on the east side of the building near the entrance to the Bonnie Doon Leisure Centre. Will there be any changes to the orientation of the parking lot? This project does not involve changing orientation of the parking lot. Will there be any changes to the hot tub (area)? Regular facility maintenance will be completed, however this project does not include changes to the hot tub. Will there be a fitness centre and/or an arena? Rehabilitation of aging facilities involves repairing and/or upgrading existing infrastructure and services. This project does not include adding new amenities, such as a fitness centre and ice rinks. A second capital project for Phase Two has been identified in the 2019-2022 capital budget cycle for City Council consideration. Phase Two involves the addition of a fitness centre, new entrance and change room facilities, as well as added multipurpose space. Is the outdoor area staying the same? Learn more about the Dermott District Park Renewal project to find out what’s happening outside of the facility. Will there be any changes to the steam room? Regular facility maintenance will be completed, however the steam room will remain the same as before the rehabilitation project. Will there be cell phone charge stations? This project does not include the addition of cell phone charging stations. Will there be any changes to the saunas and their location in the changerooms? Regular facility maintenance will be completed, however the saunas will remain located in the changerooms. Will there be any changes to the changeroom? Regular facility maintenance will be completed, however the changerooms will remain the same as before the rehabilitation project. Will there be any changes to the front entrance? This rehabilitation project aims to improve accessibility. The front counter service area was redesigned with accessible features including a lower front desk. Are you adding a new gathering space, multi-purpose room? This project does not include adding new amenities or spaces. Will there be new rental spaces? This project does not include adding new rental spaces.